So, remember how I told you that I got a new camera? Well, I'm still loving it. While I made dinner, David snapped some shots of my labors. I made Wasabi Seared Tuna Salad. It was delicious (until I found out how much sodium pickled ginger has in it - disgusting!). Mix wasabi powder with just enough soy sauce to make a thick paste. Rub wasabi paste onto both sides of tuna steaks. Heat 1 Tablespoon of oil in a non-stick skillet over medium-high heat. Sear tuna for about 30-45 seconds on each side, just enough to get a crust (I did it a little longer). Slice the tuna thinly and set aside. 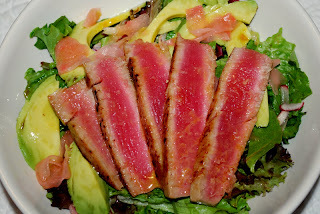 Arrange salad greens on a plate, and top with tuna, avocado, radish and ginger. Mix remaining soy sauce, oil, vinegar and a little of the juice from the ginger (if you have some), drizzle onto salad and salt and pepper to taste. Apparently, this salad goes great with Miso soup or a little sticky rice but we just had it alone. It is very filling! This looks so incredibly delicious. Thanks for sharing the recipe. I am definitely giving it a try! you are so stinking talented. is your husband just in heaven with the delightful meals o' plenty? ?